Address: St Merryn, Higher Park Road, Braunton, EX33 2LG. Ros trained in Edinburgh qualifying in Drawing & Painting (early 1960s), working since then in most mediums and on many subjects – including landscapes, still life, & portrait. Recently she has been working on abstracts, experimenting in colour with oil & resin, and also acrylics/water-colours in response to music and the subconscious. Her passion in the last six years has been creating sculptural, useful, and beautiful objects in papier mâché. 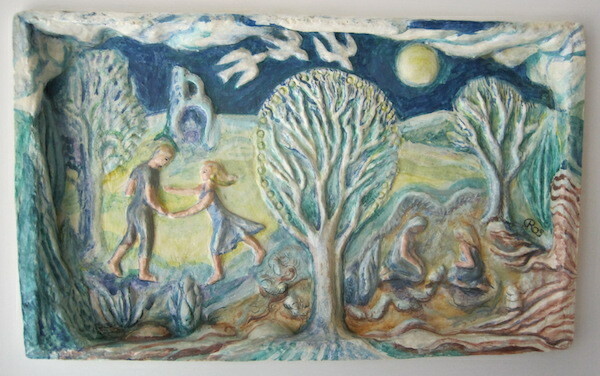 Workshops in this material will be held each day at her studio/gallery – £5 per session at 10.30am, please call to book. In addition her garden is in the NGS. Open 10.30 to 4.30 each day.